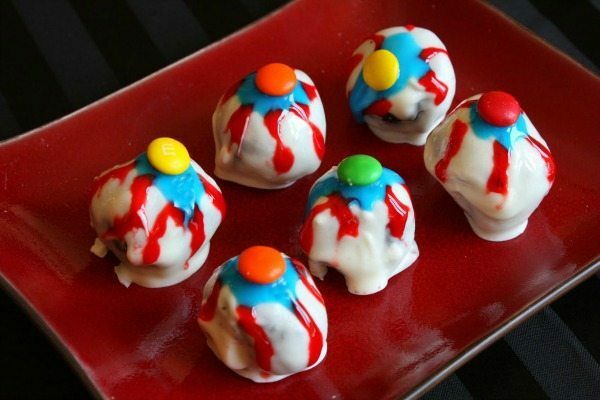 Here are some creepy Eyeball Truffles for Halloween! They’re simple to make and you’ll need just a few ingredients. 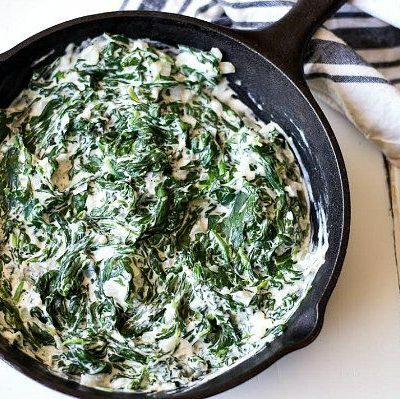 Versions of this recipe have been roaming around on the internet for quite some time. I love that these are kid-friendly, and the adults will gobble them up too. I personally like to munch on them when they’re frozen! Print out the recipe below and make them for all the little goblins in your life. Happy Halloween! Open package of cookies and set 7 cookies aside to eat later. 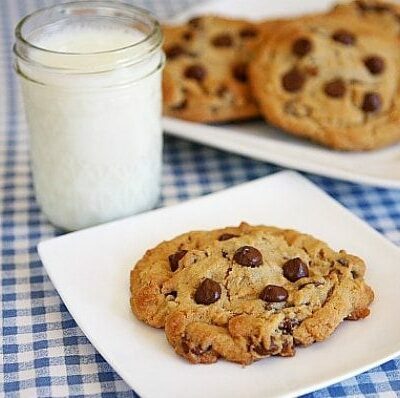 Put remaining cookies (including the cream center) in a large zip bag and crush them to fine crumbs. 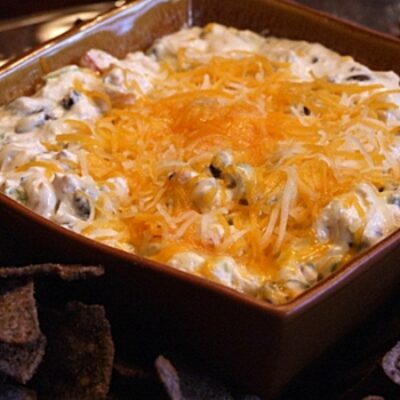 Place crumbs in a bowl and add the cream cheese. Use the back of a sturdy spoon to help blend it together. Roll the mixture into 1-inch balls and place them on a wax paper-lined cookie sheet. Place in the freezer for about 20 minutes, or until they are chilled and firmed up a bit. Melt white candy as directed on the package and then (using a teaspoon) dip balls melted white chocolate, tap off extra and set aside on wax paper covered cookie sheet to dry. Use the blue decorator icing to pipe on a circle in the center of the truffle (to make the iris). Press a piece of candy coated chocolate in the center (to make the pupil). Use the red decorator icing to squiggle lines from the center out to the sides- to create a bloodshot-look for the eyeball. Let dry & then refrigerate until ready to serve. For easy crushing, use a rolling pin or meat mallet to pound the cookies into crumbs, or simply whir them in the food processor. White candy melts are easily found at craft stores or baking supply stores. You can also use "Candy Quick," which you should be able to find in your regular market's baking aisle. Decorator icing in squeeze packets can be found in your market’s baking aisle. You can certainly make your own royal icing, but I find that it’s easier to just purchase these for this recipe. You can also use cinnamon red hot candies for the pupils of the eye. I've made these before and kept them in the freezer. A few of the eyeballs cracked (the chocolate), but most were just fine. I made these for a party last year, and they were a hit!! Not only did were they yummy, everyone thought they were so funny. 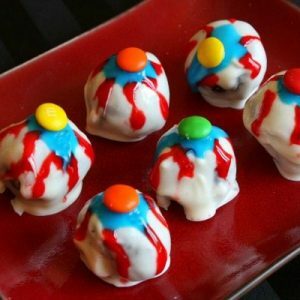 I’m entering them in a community halloween dessert contest this year, so fun!! Hey! I have a question about these. I’m entering a dessert contest and it’s a luau theme. I’m thinking I can add some rum to the batter and roll the finished balls in coconut after dipping. Do you think that would work, or would that be weird?? Not- sounds like you should try it out and see!! Good luck with your contest. Great fun, Lori. Saving this for next year! Fabulous! I’ll be adding these to my list for next year’s party! I’m sorry – as much as I admire the creativity of coming up with this stuff – I’m just not that into it. Guess I’m kinda bah-humbug about all the macabre, spooky food. I wrote about it in my blog this morning. These are great, and I love the video! Are you kidding—–these are awesome girl! Such a cute munchie for all the Halloween guests! These look AMAZING! And so simple too! I am seriously impressed! makes me wish I had kids!! What a fun treat! Great job with the video too!